MLS Data Fudged By Realtors. Watch out! If you are putting in an offer to buy a house, and you aren’t using a FranklyRealty.com agent (God knows why you wouldn’t but lets just say you are stuck with your agent), make sure you have your agent look out for MLS fudging. There are 2 levels of MLS fudging. One is a NVAR (Local Realtor association) violation and the other is borderline ethical. And there are 2 reasons agents fudge the MLS. This is what happens when a listing agent wants to re-list a property they are already listing for sale. Maybe the house has sat for a few months or there is a big price change. Instead of a 2 minute change, they will withdraw one listing and spend 30-45 minutes reentering all the data. b) Reset the “Original List Price”. So if a house drops from $600k to $550k after 100 days, and the plan is to drop again, but to $500k, the “borderline fudger” will do a normal delist (expire or withdraw) and relist. 80% of Realtors will see the DOMP at 101 and look back at the old listing to get more information before making an offer. I found one agent did this 17 times! c) Leave NO indication that this property ever was listed. It looks like a 100% brand new listing. This is a NVAR violation. Maybe only 25% of Realtors will find this fudging. They know that when submitting an offer they should search for expires and withdrawn listings for that address (and variations like St vs Street and N vs North). What a shame that we can’t trust our fellow Realtors to be honest. In the graph above, that is not the default of what a Realtor sees after a search. I had to create a special search to put it in that form. It is much harder to find. Also note that in this case the first 4 light fudgings were from one agent and then a new agent took it on and did the Tax ID=0000 to reset everything. This is NOT as bad (still illegal) as one agent relisting multiple times using the 0000 trick. Thanks to Business Week for doing a story on MLS fudging. First, I have to thank Frank Borges LL0SA, the tech-savvy owner of FranklyRealty.com in Arlington, Va. He found me a slew of examples of apparent DOM (days on market) manipulation, although I wasn’t able to mention any of them in my article for lack of space. He wrote about relistings on his blog here and here. Watch out for this one too. Right before settlement one agent I know of goes back and changes the Sales Price to what will actually be the settled price or close to it. Then when she is on listing calls, she shows clients a list of her sales that make her look like she has a high success rate getting the sales price. Without a history of the property it can be vary deceptive. Another thing to watch out for is falsification of the number of bedrooms. For certain homes (e.g., those with septic fields instead of sewers), especially newer ones, an agent will list the number of rooms that might (legally or illegally) be used as bedrooms rather than the number of those that are proper bedrooms or the number of bedrooms for which the property “percs”. A number of condos are also up-roomed, with 1BR+dens being listed as 2BRs, studios that have had a thin interior wall added listed as 1BRs, etc. The result is twofold: the buyer of the dwelling may end up overpaying and, after the sale, properly listed comps can look comparatively overpriced when, in reality, they are not. What is the NAR penalty for such behavior? 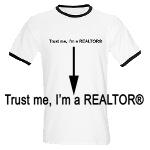 They keep advertising a “Realtor Code of Ethics” yet this practice is rampant among realtors. I live in another state and keep track of realtor MLS relistings on my own, which is very time consuming. The average consumer who has not invested such time is a sitting duck. The NAR penalty for such unethical realtor activity should be a $1,000 fine for the 1st occurrence, and loss of all NAR realtor credentials for a 2nd occurrence (i.e., “you’re fired”). There should also be a $500 reward paid to any realtor who anonymously reports such bogus relistings. As long as the NAR continues to ignore the problem, it will exist, and it ill reflect poorly on both the NAR and realtors in general. The fine for illegal (full fat) fudging was just $50 until BusinessWeek got a wind of this post. It has since gone up to $1,000. I love the idea of an incentive or bonus to report these errors. I have reported 130 violations (of all sorts) to MRIS, so I could get rich from that. Also I have suggested to MRIS that they NOT reset the “Original Price” when a property is relisted. That would reduce the motivation for Fat Free (legal) fudging. I just checked a property that a potential buyer lost out on. The MLS showed list at $402k, sales price of $400k w/ no seller concessions. My buyer was going to submit a last minute offer to try and get the property before it went pending, but I was told by the listing to forget it unless he can go in around the $340k area all cash. My buyer could not prove all the cash on that day, so we were not able to submit offer. Today I find out that the buyer paid $443k for the house but $43k went to 2nd lein holder. To me this is fudging the MLS. Frank, you’re thoughts? Interesting. Never heard of that before. Not sure how that should be listed on the MLS. Maybe they need to put a new field in. I ahve noticed that an agent has had photos of a rehabbed house removed so when you look at the house and go to map it the old before rehab photo is there, it has been changed so that you can not see the bad condition of the roof, it was compared to the old roof and was not repaired as stated in a fake roof certificatin. Is MLS NVAR illegal in West Virginia? If a residential property is purchased under a land trust, doesn’t the sales price remain confidential or can it be placed in the MLS anyway in Illinois? There are many reasons why a listing may need to be withdrawn and re-listed, for example, work being done on or around the property (roads, etc.) that render showings next to impossible for a period of time; seller changes in circumstances requiring them to wait a bit before selling/closing a deal; new developments nearby impacting one way or the other prices in the neighborhood, and so on. I would say posting information that implicates another/other agent(s) is using unethical practices is in itself unethical! Sure there might be a 1% reason for doing what they do. I am focusing on the other 99%. Hello, my listing agreement with the broker expired on August 15 2015 on which date the property was “withdrawn” from MRIS. MRIS lists withdrawn date correctly but is still accruing DOM-Prop two months later. I do not have a good relation with the agent at this time. It also seems that agent jigged it (she went in the MRIS and made a change on Sept 9 – 2 days after listing agreement expired) somehow to keep accruing DOM-Prop. What are my options? Thanks. Hello all! I have an unusual question, I am a wholesaler for an investor. I recently came across a property that was for sale however, the seasoned realtor i contacted could not find the listing for several hours! She only then found it when googling the address and catching the brokers name on ONE reputable real estate app and noticed it is listed under just land in the MLA even though there is a unfinished rough in 2,600 sqft home on the 3.4 acres! After She called the broker and got approval from her to show the property, the broker came out and met us, unlocked the property (no lock box) and took off. Well after considering the rough in unit, I see building permits on a post from the project that obviously ran out of funding from the previous owner. I proceed to take pics of the contract for my investor even though the permits are over a year old. When I get home and am looking threw my photos I notice thAt the buyer’s name is the same as the broker! However, she made absolutely no mention tha. The property she is representing is also her own.. I’m not sure what the heckis going on here. WhY should I do?? I haven’t told my actual realtor what I have found yet..